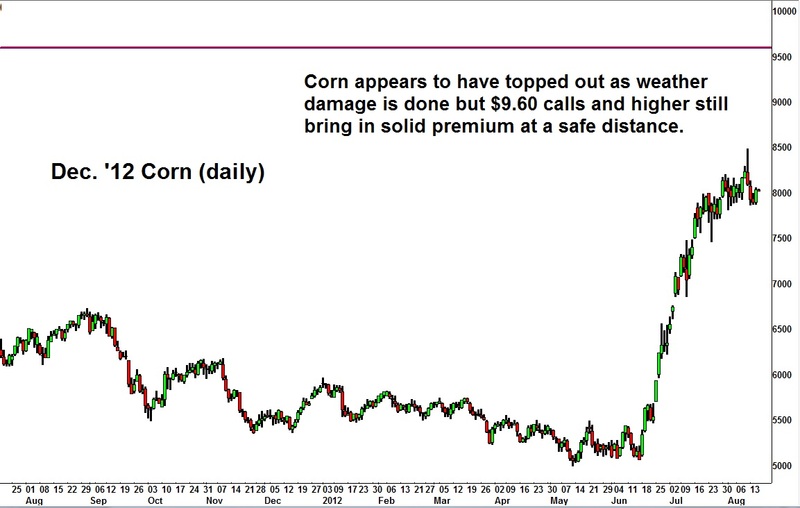 Corn: With weather damage now known, is it time to sell calls? You've seen it on the evening news all summer: The U.S. drought of 2012. Particularly hard hit was the Midwest where corn, wheat and soybean crops have all been affected. Grabbing the most headlines was the corn market. Unlike the soybean crop which goes to pod in August, corn pollinates earlier in July. This critical time for crop development occurred right in the heart of the 2012 drought. The result? A projected corn harvest 13% smaller than last year - the lightest harvest in six years. With corn demand continuing to climb globally, any setback to supply can have an outsized effect on price. Indeed, the 2012 drought resulted in corn prices soaring to an all time high of $8.49 per bushel earlier this month. But even the most extreme weather markets eventually reach a point where the damage is priced into the market. For corn, that point may have been reached. Last week's price record was immediately followed by a tumble in corn prices back below $8.00 per bushel. It is possible we are at or near the high water mark of this year's corn rally. And it is not just because of the ominous looking (if you are a bull) chart formation. In corn, that appears to be playing out. U.S. cattle feed yards, responsible for an outsized share of U.S. corn demand, are indeed crying uncle. With corn hitting levels above $8.00, feedlots are liquidating their herds, slaughtering cattle earlier and thinning breeding stock. The USDA estimates U.S. corn demand falling by 10% from last year. This is due in no small part to the higher prices being forced on end users like feedlots. It is likely that the August U.S. Department of Agriculture supply/demand report gave us a good indication how the 2012 corn crop is going to end up as a result of the drought. We think the time for any surprises is now behind us. While corn prices remain near their highs, values are clearly hitting levels that discourages demand. Yet call option values remain grossly inflated. If you are an option seller, these are the kinds of situations you seek. In this case, a seller of calls can collect deep out of the money premiums at a time when the bulk of the weather story is likely priced into the market. We continue to see excellent premium in the December options and favor strikes at or above the $9.60 level (See chart). This is over 32% above the current price of corn. To see these prices, corn yields would likely need to drop another 10-20% from current levels. This is a scenario highly unlikely this late in the game with harvest set to begin over the next 3-4 weeks. It is how you play true fundamentals against hype.